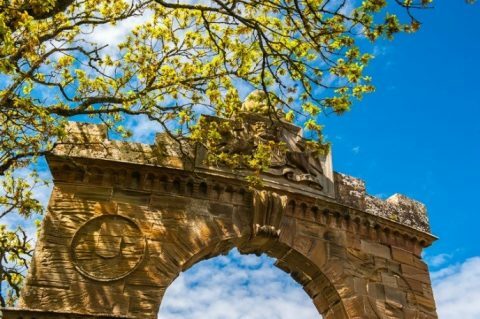 Culzean Castle is set on the cliff side of the Ayrshire coast with stunning surroundings and views to Arran. It is truly fit for a king…or a President in fact. How did Culzean become what we see today? Culzean Castle has changed a lot from its original structure, a modest stone tower house built in the 16th-century. It was the home of the Culzean Kennedys, one of Scotland’s oldest families and descendants of Robert the Bruce. When Thomas Kennedy became the 9th Earl of Cassillis in 1762, he had already begun modernizing Culzean. He decided not to move to the primary Cassillis family home, but instead to stay at Culzean and continue to renovate the property. Thomas passed away in 1775, and his brother David became the 10th Earl of Cassillis. It was David that commissioned Robert Adam, the most fashionable architect of the day, to transform Culzean Castle into something much more grand and romantic. The task of rejuvenating Culzean was no mean feat. It took 15 years of Adam’s relentless work in a four stage process. The changes included the addition of a wing to remove the previous “L” shape, resulting in the north-facing front overlooking the sea. This new wing included a brew house, milk house, and more bedrooms and living space, adding to the grandeur of the Castle. A circular drum tower was built in the middle of the Castle, providing views of the spectacular Ayrshire coast. This addition created a darkened hole which Adams resolved by installing an open staircase. 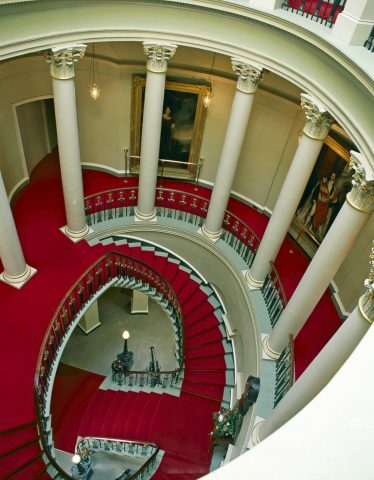 However, the area wouldn’t support a circular staircase so he drafted an innovative design for an oval staircase. The now iconic staircase would link the old castle with the new wing. As you can imagine, all this was starting to get expensive. In 1783, Earl David entailed the Castle and title of 11th Earl of Cassillis to a distant cousin, Captain Archibald Kennedy, a wealthy naval captain from New York with the means to keep the Estate intact. The decision proved critical and it can be argued the influx of the American funds ultimately saved Culzean. Flash forward to the 20th-century…guests enter the Castle by the circular saloon and are then led up Robert Adam’s spectacular oval staircase to the top floor, where the Eisenhower Apartment can be found. Yes, that’s Army General and President of the United States Eisenhower! 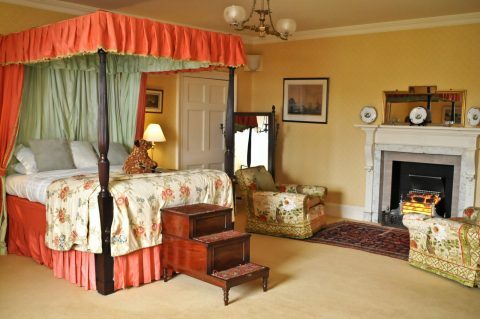 How did President Eisenhower get a room named after him at Culzean? After much consideration and a desire to preserve the history of the Estate, the 4th Marquess of Ailsa (the 1st Marquess of Ailsa was the 12th Earl of Cassillis who was childhood friends with King William IV who made the appointment) approached the newly formed National Trust for Scotland to discuss handing over the Castle to the Nation. In 1943, before any decision was taken, the 4th Marquess died. In 1945 the 5th Marquis of Ailsa followed through on his brother’s plans and gifted the Castle to the National Trust for Scotland – though Lady Frances, the widow of the 4th Marquess, did most of the negotiating – and it became one of the many properties under the Trust’s care. In this gift, Lady Frances asked for the top floor of Culzean to be made into a self-contained apartment with the intention of it being offered to General Dwight D. Eisenhower. The gift was a gesture of gratitude from Scotland to America in recognition of Eisenhower’s role as Supreme Commander of the Allied Forces in Europe during World War II. 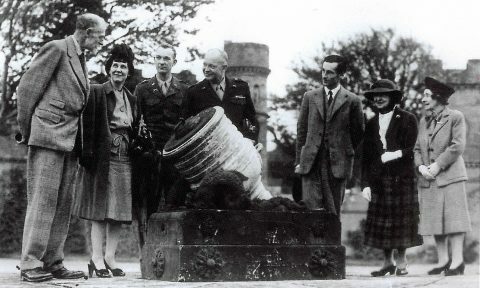 Eisenhower visited Culzean on four occasions, one of which was when he was President. His first visit was in 1946 and his longest stay was in his retirement. The grounds of the Castle provided the perfect setting for him to paint and take walks in the gardens – which NTS are working on restoring at the moment! 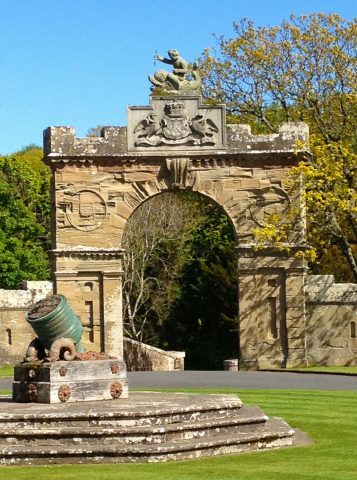 Culzean Castle and Country Park is much more than a castle, the grounds and gardens have a rich history too! 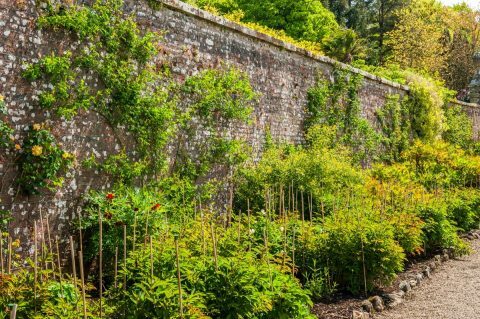 Culzean is not limited to just one garden, in fact, it has several including a Walled Garden which is a current priority project here at the Foundation. Sheltered by the topography and Adam’s crenelated terrace walls, the wide terrace borders provide a mild micro-climate for fruits, tender shrubs, flowers and dwarf rhododendron. Many years ago this was used by the cooks of the Castle where they could get their herbs and produce to make the meals for the family and guests to the Castle. The Trust plans to restore the Walled Garden as a fully functioning 19th-century kitchen garden producing fruit, vegetables and cut flowers for use on the Estate and for sale. The total project costs for the restoration project are budgeted at $90,000. NTSUSA’s treasurer, Kennedy Richardson, has challenged the Foundation to raise half that amount by December, which he will then match dollar-for-dollar. Culzean Castle, which has special significance to American visitors due to its long and distinguished association with President Eisenhower and its ancestral connection to American Kennedys, is one of the Trust’s most visited and iconic properties. Sound like a superb place for a holiday? After Eisenhower’s death, the National Trust for Scotland opened the apartment to a wider public. It is now a unique venue for corporate and private hospitality and is also one of the Trust’s flagship holiday properties. Superbly furnished and extremely comfortable, the apartment has six double/twin bedrooms, which are available either as individual accommodation or for groups of up to twelve. Guests share an elegant drawing room and dining room, where the best of Scottish food is served.